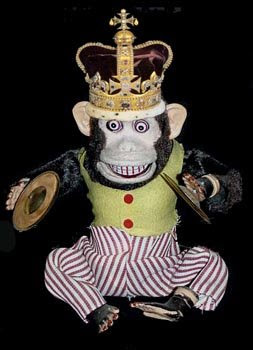 Okay, stop doing searches for "mechanical-monkey-playing-cymbals." The monkey is tired of being dragged into your mindless exercises that involve killing time surfing the Web rather than working or doing school work or whatever else you should be doing. Enough of your monkey business. Ha Ha...I crack me up. "Hey, hey he's a monkey. And people say he's monkeying around. But he's too busy singing. To put anybody down." "Ain't nobody got nuthin to hide 'cept for me and my monkey." They don't write lyrics like that anymore. The monkey has been a bit depressed these days. He just sits there wearing a wig fashioned out of a green pom-pom he picked up at one of the last Seahawks games before they fizzled out shy of yet another Superbowl. The monkey is a real Hawks fan. He still has that grimace on his face that he had when Hasselbeck chucked the ball into the end zone in the final seconds of the first Wild Card playoff game and watched it bounce out of the receiver's hands and onto the fake turf. The monkey hasn't been the same since. Maybe he'll cheer up when the Mariners start playing again. Well, if they win, maybe. The monkey is a fair weather fan. He's a bit worried about Social Security, too. And no, the monkey isn't my alter ego. I've got Elvis for that.